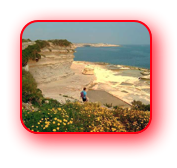 Walk 1 - Marsaxlokk to Marsascala via Delimara Point. 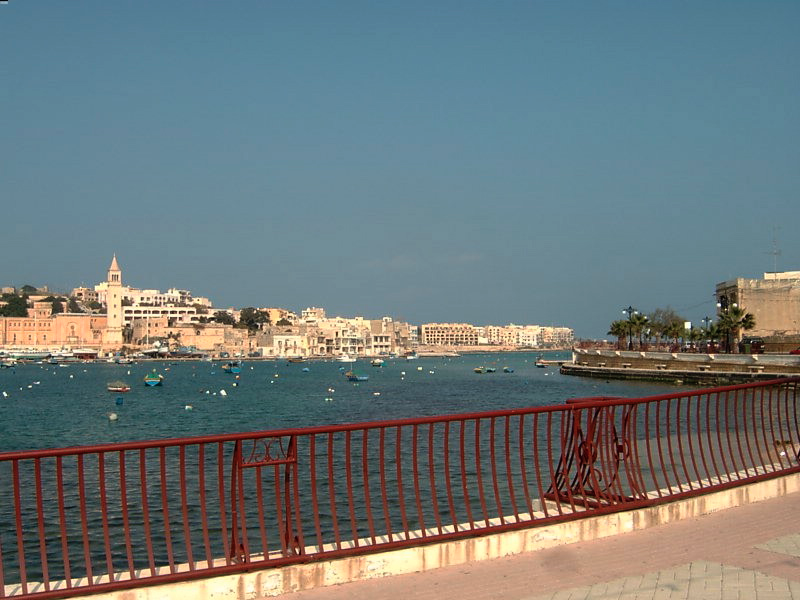 Getting to Marsaxlokk. 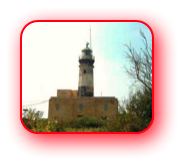 From St Paul’s Bay – No. 427 Bus. Takes about 45 minutes. 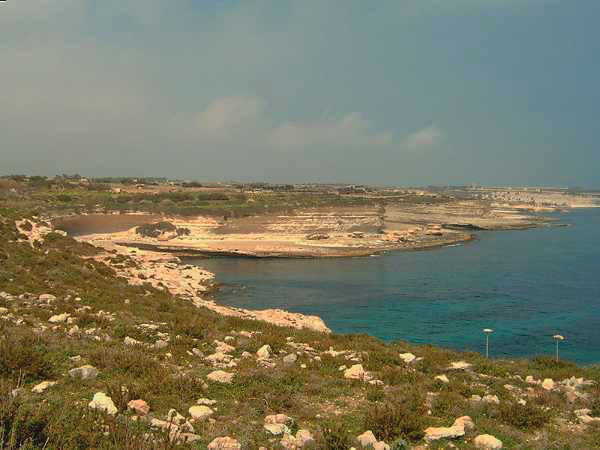 I’m not sure if the Maltese Authorities agree but I consider the two extremities of the island – the Maltese equivalent of British Lands End and John O’ Groates - to be Delimara Point on the south east and Cirkewwa at the north west of the island. As the nearest place on a bus route to Delimara Point is Marsaxlokk, this is where we found ourselves mid morning on the 18th March. 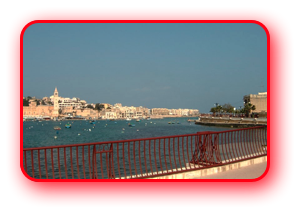 I had considered getting a taxi to Delimara Point, which is just over 2 miles from Marsaxlokk, but having asked a local “cabby” the cost and receiving a price of the Malta equivalent of just over £5.00 we decided to walk. 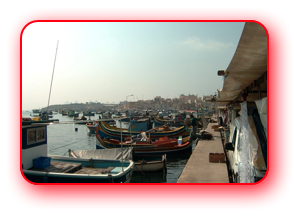 However, as this would take us about an hour, we started off to Delimara Point straight away and cut short the time we spent looking at the market stalls that are a daily attraction on the harbour side at Marsaxlokk. There was one regret about leaving so soon after our arrival, Anne did not have time to buy a supply of Maltese handkerchiefs, which she considers not only to be a lot cheaper than English equivalents but one of the cheapest/best value purchases available on the island. 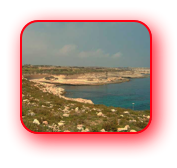 For a little bit more information, including photographs, on Marsaxlokk and some other favourite Malta places then click here. 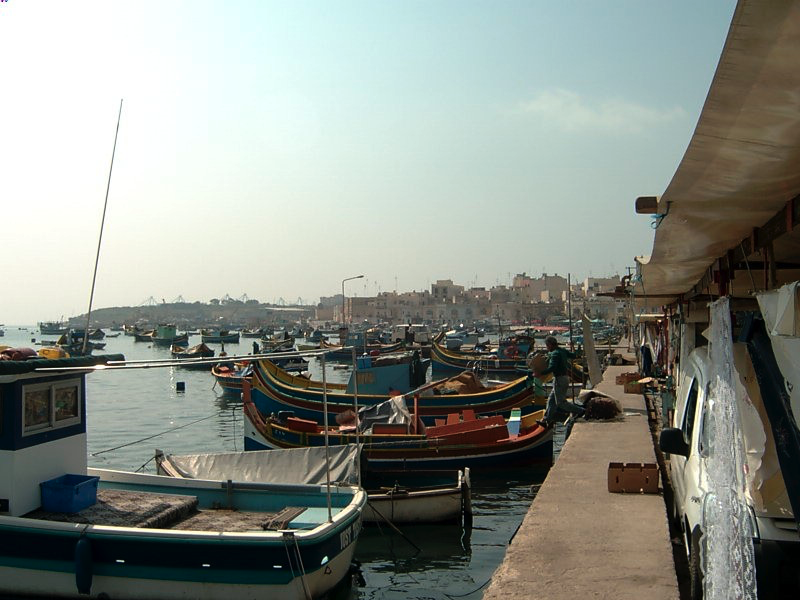 We left Marsaxlokk and its market and walked along the coastal road, with the sea and harbour on our right, stopping only to admire the boats and take advantage of the new public conveniences that had been erected since our visit last year. As far as I am aware there are no other public loos after these until Marsascala is reached. 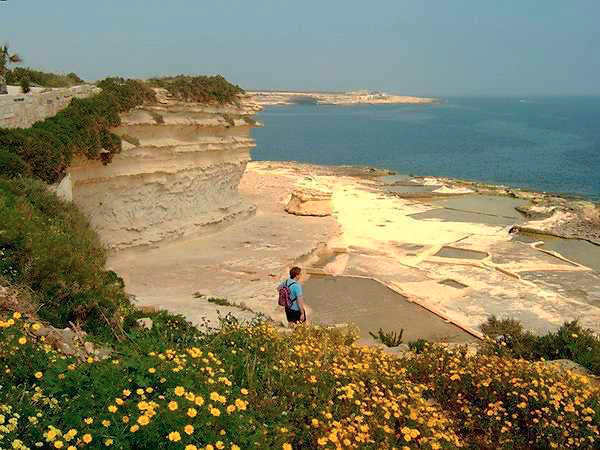 via Delimar Point to Marsascala. 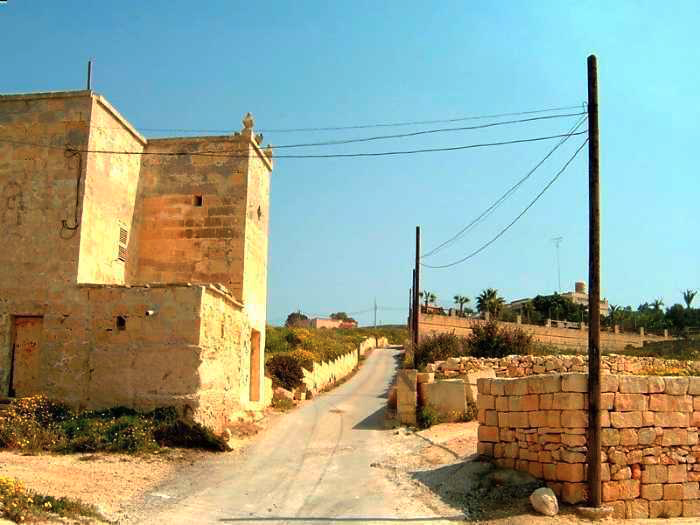 thought our route would vanish all together the track turned left, in a few yards it turned right, and then widened before it reached its junction with the main road – a very narrow main road – between Marsaxlokk and Delimara Point. Here we turned right and followed the road towards the lighthouse at Delimara Point. 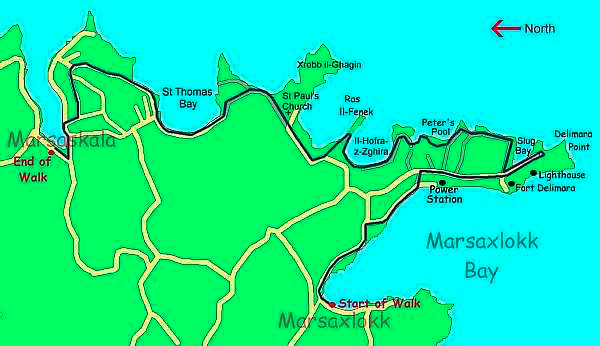 Along this route are excellent views of Marsaxlokk Bay, but unfortunately the overall beauty is interrupted by the coastal industrialization, particularly the large port to the west of Marsaxlokk and the chimney of the Delimara Power Station which was to dominate many of our views for the next hour or so. 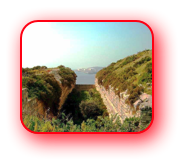 Just before we reached the lighthouse we came to Fort Delimara, part of Malta’s old coastal defences, with its massive moat and soon after, to the buzzing of bees, we reached Delimara Lighthouse. 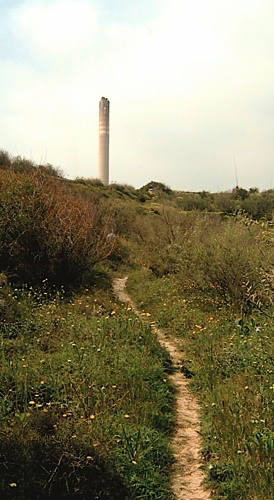 The steep track which took us away from the sea wall and the road to the Delimara Power Station. 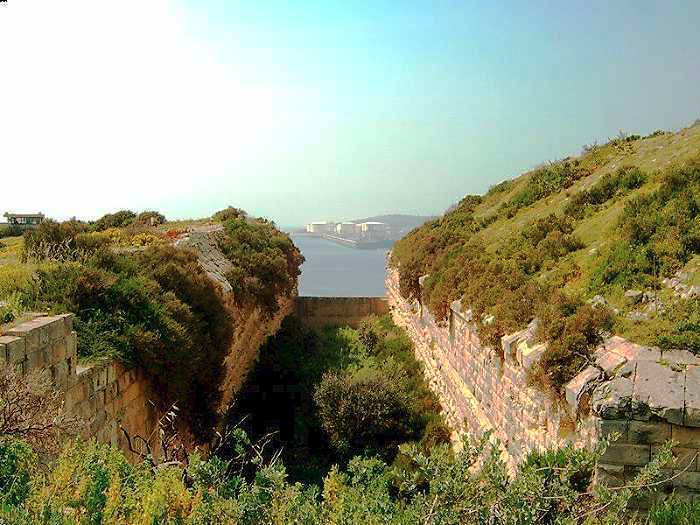 The moat at Fort Delimara, with Marsaklokk Bay and some of its industrialization in the distance. A couple of times on our walks across the island we have found ourselves in the company of bees. Usually on a day like today, when the sun is hot and there are plenty of the suitable nectar giving plants about. However, after having continued past the lighthouse to have a look at Delimara Point we retraced our steps and were relieved to have left the bees behind as we turned right(east) just beyond the Fort Delimara Moat and took the path down towards Slug Bay and to what I considered the proper start of the walk. 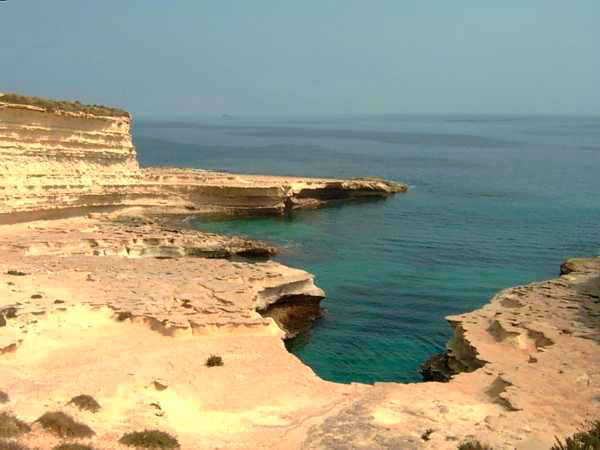 Slug Bay, not a very pretty name, is without sand and, like most of the bays between Delimara Point and Marsascala, has been formed by the sea crashing against the limestone cliffs, which makes this part of the Maltese Coast so rugged and interesting. From this bay we took the path north with the beautiful clear blue sea on our right. 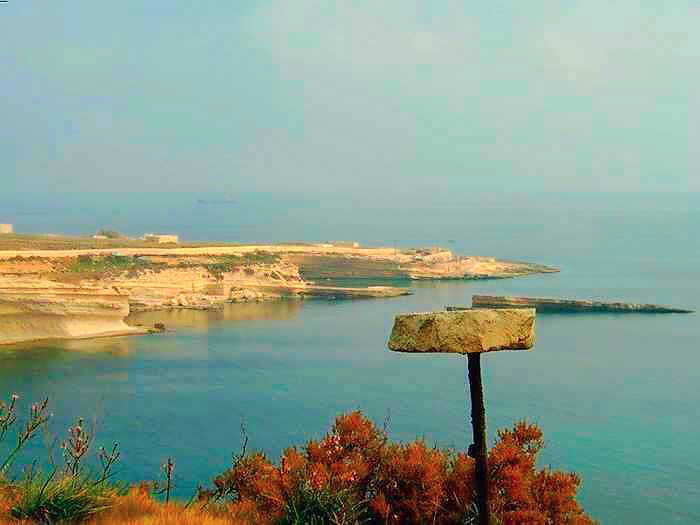 We are always amazed how clear the sea is around Malta, which makes it very much a mecca for underwater exploration. Soon we approached Peter’s Pool, another bay, which was easy to identify by comparing its shape with that of the map. Here the track we had been following turned inland (west). Our route however was still northwards crossing an area, which, like so many of the wilder parts of Malta, had a number of “bird huts” and an array of “bird plinths” on it. 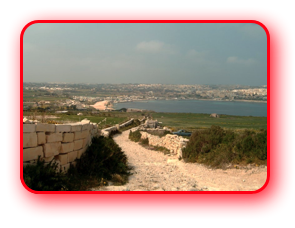 In recent times there have been big concerns about the Maltese attitude to wild life, particularly the shooting and catching of birds. 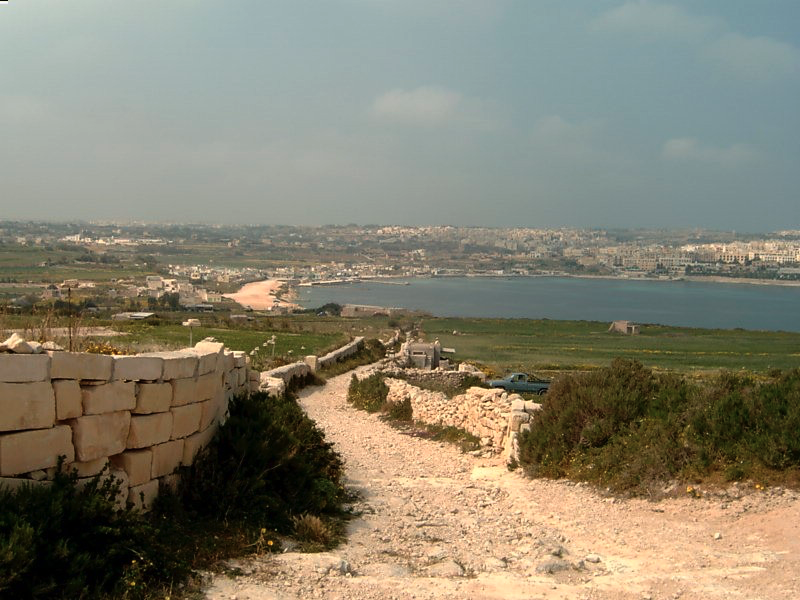 Although the Maltese Government has tried to control the “birdmen”, it would seem that a large number of islanders consider shooting and catching birds to be an acceptable pastime and any legislation that has been made has generally proved ineffective. Although most will condemn the “birdmen”, most countries have, or have had in the past, unacceptable practises with regards to animals, such as fox hunting in Britain. 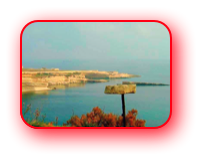 Bird catching, and sometimes shooting them, has been a way of life for the Maltese for generations and this conditioning will take some time to eradicate. So when I see “birdmen” in their huts I give them a wave and a cheery good day, although I know that Anne, alongside me, would love to let the trapped birds out of their cages. If I remember correctly, this is Slug Bay. Very pretty, but what an awful name. Peter's Pool - another beautiful location. 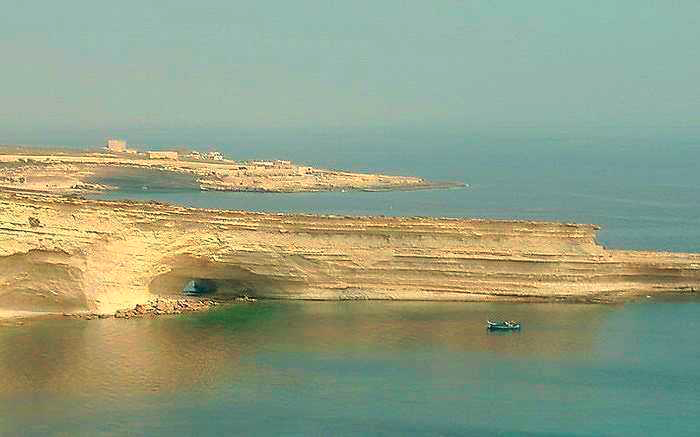 The cliffs and limestone slabs at Il Hofra z-Zghira. A quiet spot to do some sunbathing. 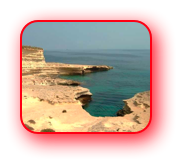 Having passed Peter’s Pool we reached Il-Hofra-z-Zghira, and took the opportunity to leave our cliff top path and go down to sea level. Here there are massive flat rocks, ideal for sunbathing, and it is undoubtedly a wonderful sun trap, although because of its isolation it is unlikely to get overcrowded. 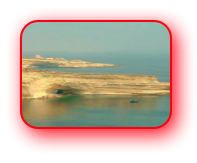 We explored this “lido” and admired the “arch” in the headland called Ras il-Fenek located to the northside of this bay. 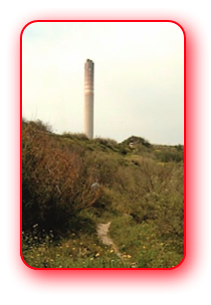 Unfortunately, unless we wanted to do some dare devil rock climbing there is no way from this area other than by the way we came, so we turned around and within a few minutes we had ascended the steps, adjacent to a very well located house, and rejoined the cliff top path. From here we continued northwards around the bay where we came across the only difficult part of the walk. There were a couple of places on the path that descended quite steeply and, as the surface of the ground was a bit loose, care was necessary. 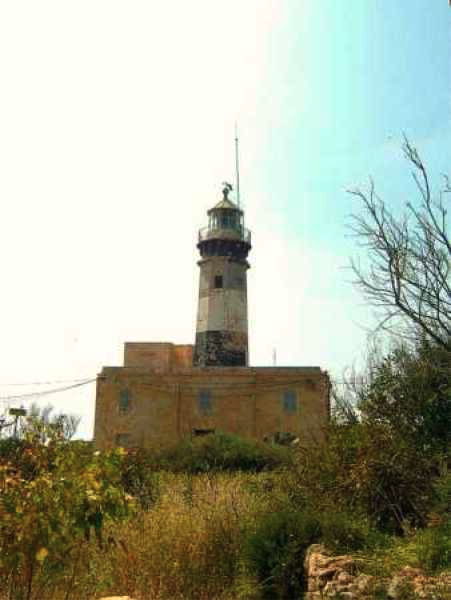 This small difficulty over, we went on the Ras il-Fenek headland. Xrobb il Ghagin with bird table/trap in the foreground. Although most maps seem to have no evidence of paths on this headland, we took a path going east on its south side, and with a bit of helpful sign language advice from a “birdman” in his hut, crossed over to the northern edge. 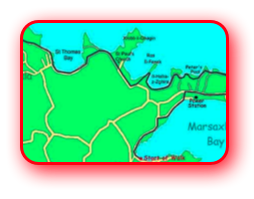 We then went west following a path that went through fields which ultimately lead us out on to a road just south west of St Paul’s Church near the start of the Xrobb il-Ghagin Peninsula. At the road we turned right and in a few yards, as the road bent right towards the peninsula, we took a track on the left, and passed a gate on our right that looked as if it was an entrance to the grounds of the church. We continued along the path, now with a high wall on our right, but were greeted by more views of the sea when the wall ended. Looking northwards to St Thomas Bay. Continuing along the path we soon came to a high vantage point with good views northwards to St Thomas Bay and beyond. Here we took the path on our left that descended between walls down to the bay. 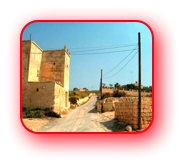 Initially, like the outskirts of many Maltese coastal communities, this area was very unappealing. There was a large area that would no doubt be full of cars at busier times and was, according to Anne, a little bit smelly. However, we soon left this behind us and the main area of St Thomas looked much smarter. But it was like a ghost town. St Anne's Church in the distance. Very few people were about and we saw no cafes or bars, and we had been looking forward to drinking something other than the water, which we had carried with us. We thought we must find a refreshment stop soon, so we continued to follow the main road through the town, which gradually curved left and within 20 minutes or so we were going downhill to the harbour area of Marsascala Here we found a pleasant little cafe and sat outside and enjoyed a glass of Kinnie. Refreshments over we caught a number 17 bus to Valletta where we swapped it for a number 49 to take us back to St Paul’s Bay. Whoops – nearly forgot to mention the Dog Dazer. 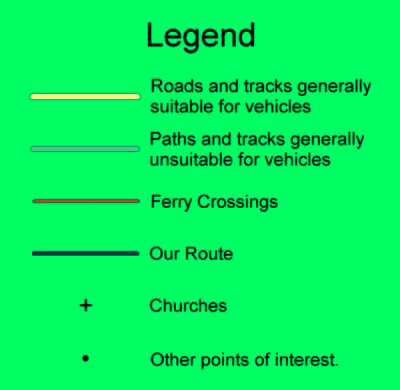 When we first considered this walk we thought about taking a walking pole each. Not that we felt we needed one for walking but as a protection against Maltese dogs. We decided against this and instead took a Dog Dazer, a small electronic device which, when pressed, gives out a high pitched noise which dogs do not like, but is almost inaudible to humans. On this walk we found it very useful as we did come across a few” noisy” dogs that wanted to pay us less than friendly attention, and it acted as a very good deterrent.